How often do you travel to a new place and feel that there are too many things to see but not enough time? 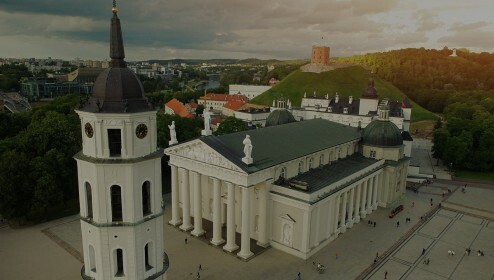 Vilnius is the biggest capital by area and second by population among the Baltic countries, therefore it has a lot to offer. It’s still a quite small city and most of the time you won’t need to use public transport to get around. All the sights and monuments, as well as other highlights are close to each other. As a traveller there are 6 most attractive districts that you’ll want to experience. Curious what you can find in each of them? Let’s have a look! Old Town is the place where it all started in 1323. There is no doubt that this district is the most popular, not only among tourists but also locals. When you walk on the streets, you can hear the Baroque rooftops whispering to you. They silently guide you through those narrow side-streets, through mysterious wooden doors to the tiny cafeterias and cozy boutique shops. Then, suddenly, you’ll find yourself in Cathedral square. Again! How? Well, the saying “All roads lead to …” works with our Cathedral too. It’s magic. There’s no other way to describe it. Cathedral square is a wide area passed by hundreds of people every day. It is a good place to hang out with friends, popular for skateboarding as well as for open air concerts all year round. In winter you’ll find the main Christmas tree and a market here. 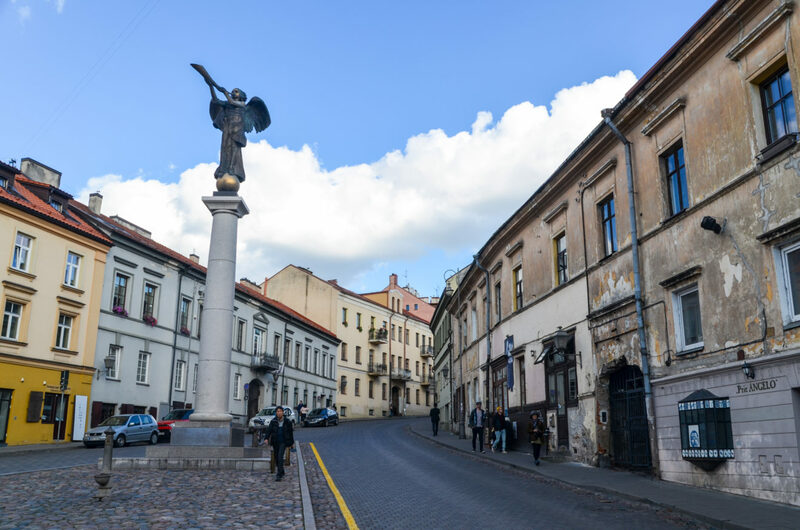 The main attractions are the bell tower (pro tip: go upstairs and enjoy the view of the Old Town) and, of course, the Cathedral Basilica of St Stanislaus and St Ladislaus of Vilnius, which is the main Roman Catholic cathedral in Lithuania. It goes without saying that Cathedral Church is a must-see, being one the best examples of classicism epoch in Lithuania and has remained in its original look since 1783. Don’t miss the hidden treasures – the tile “STEBUKLAS” (lit. miracle). It’s the small tile located between the Cathedral and the bell tower. The rumors has it that you need to stand on the tile, make a wish and spin three times clockwise and the dream will come true! The brick with two feet imprinted on the top. It is located a few meters from the bell tower and was put there by Artūras Zuokas, the former mayor of Vilnius. 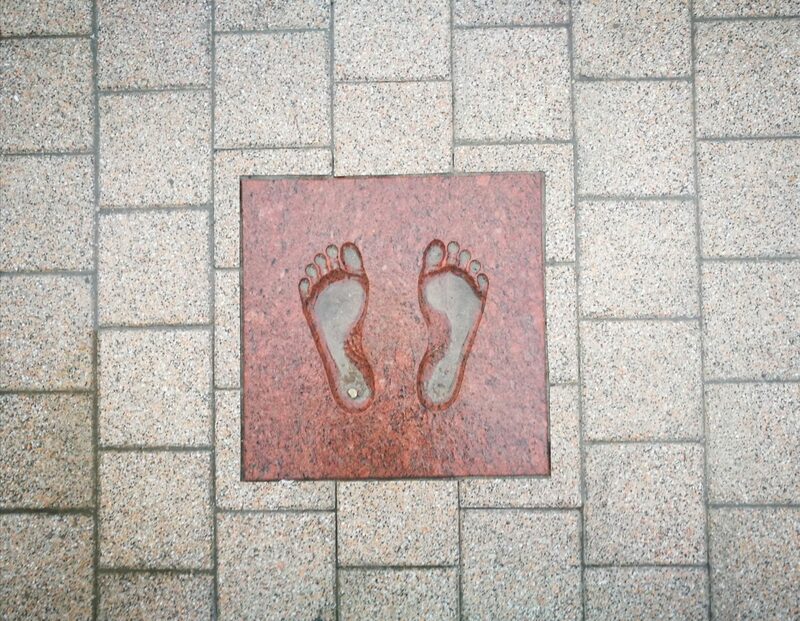 In both Riga and Tallinn you’ll find the same tiles which were a gift for the 20-year anniversary of the Baltic Chain, the event which happened in 1989 August 23, in order to commemorate the 50 year anniversary of Ribbentrop-Molotov pact. More than 2 mln. people from Lithuania, Latvia and Estonia made an unbreakable human chain (which later was added to UNESCO’s Memory of the World Register) connecting all three Baltic capitals and peacefully showing the world their protest against Soviet regime. Another interesting treasure for the museum enthusiasts is the Palace of Grand Dukes. It is the former political, diplomatic, cultural center of the State. The Palace was famous all over Europe in the 15th to 17th centuries. Unfortunately, it was demolished in the beginning of the 19th century and rebuilt in 2013.The reconstructed palace represents the most important architectural styles: Gothic, Renaissance and early Baroque – which made an important impact of the Palace former and current construction. The Palace of Grand Dukes now has 4 exhibition tour routes directly related to the historical functions of this residence. Pretty cool if you want to get familiar with our glorious Medieval history. While visiting the Cathedral Square it’s almost impossible to overlook the hill behind it topped with the beautiful medieval Gediminas tower. That is the symbol of Vilnius and the distinctive sign of Lithuania. According to a legend, the Great Duke Gediminas once had a dream where the iron wolf was howling on the top of the hill. He woke up all confused and went to his Wise-man Lizdeika who explained the dream by saying that the duke has to build a capital city on the hill where the wolf howled. Ever since the 13th century the tower is standing in the same place. Hike to the hill, visit the tower, watch the exhibition and enjoy the spectacular views of the Old Town! Gedimino Avenue – one of the busiest and most popular streets with all the bigger shops, cafes, restaurants and squares. It starts from the Cathedral Square and ends by Neris river, near the Seimas (Parliament in Lithuanian) of Lithuania. On the Gediminas Avenue you can find the former KGB headquarters currently known as the Museum of Occupations and Freedom Fights. Pilies street – another popular street, especially among the tourists. You’ll find plenty of restaurants, cafes and souvenir shops, listen to live music and enjoy the live show performances that appear at any unexpected corners. The street starts from the Gediminas tower and ends at the Town Hall. Literatų street – in 2008 a group of artists had an idea to revive the street and decorate it with artworks devoted to the writers of Lithuania. 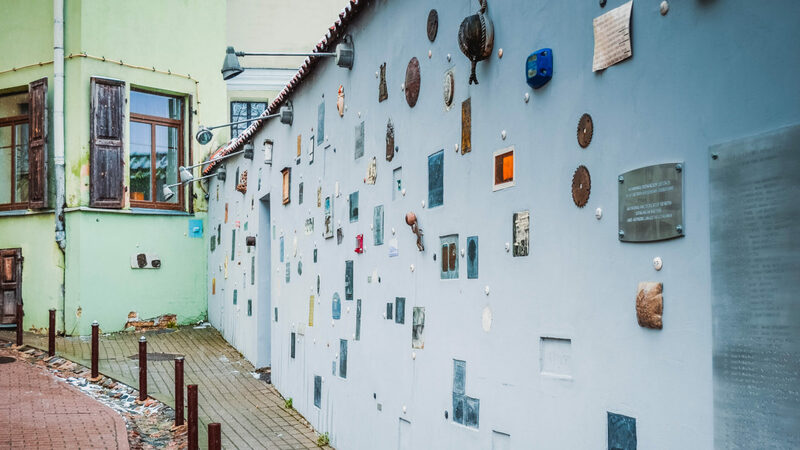 Now it features a wall filled with plates and other small objects made of metal, wood, glass, etc by Vilnius artists. The street is connected to Pilies Street, therefore, it is quite easy to find it. Take a walk in Universiteto street which brings you to a few very important buildings. Starting from Gedimino Avenue, first you will see a square with Lithuanian, European and NATO flags. Behind them there is a beautiful bright palace. Dating back to the 13th century this is the Lithuanian Presidential Palace. If you register in advance you can join a guided tour inside for free! Another important building over here is the Vilnius University Campus. Founded in 1579 by Jesuits it makes it the oldest university in the eastern part of Europe. Find the bell tower or explore the library where various history-related movies, such as upcoming HBO movie with Helen Mirren “Catherine the Great” has been filmed. Fans of greenery should hike up to the Hill of Three Crosses which gives a breathtaking view of Vilnius Old Town. That’s the highest point that you can get to in the city and it is totally free! Greet the dawn or sing farewell to the sunset of Vilnius, have a picnic during the day or walk your dog at night! Any time of the day – it’s there, open 24/7. Etno dvaras – this restaurant in Pilies street is known for the best potato dumplings (cepelinai) in town. Don‘t get any starters before the main course – you’ll be shocked by the size of these babies! Right next to the Old Town, across the Vilnia river you will find a cozy neighborhood which stands out for its unique artistic spirit. The name of the UNESCO World Heritage listed Užupis stands for “the other side of the river” in Lithuanian. 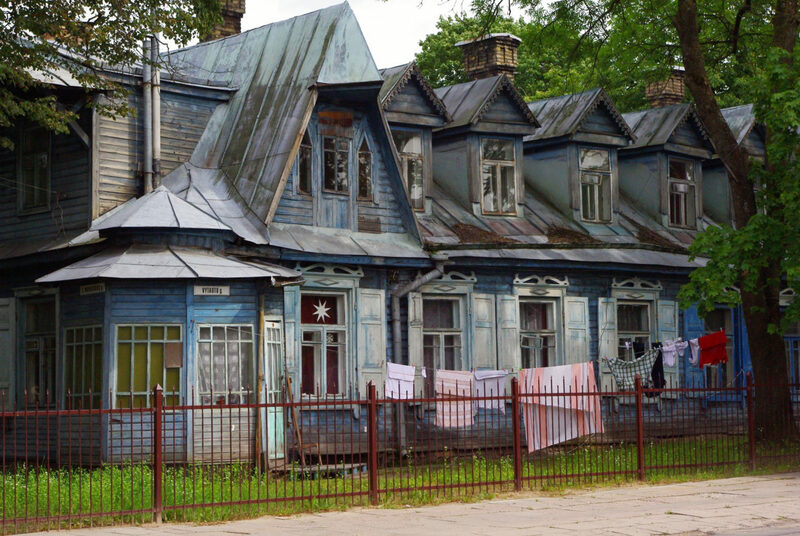 Until Lithuania’s declaration of independence in 1990, it was one of the most neglected areas of Vilnius with many run-down houses, most of them without utilities. 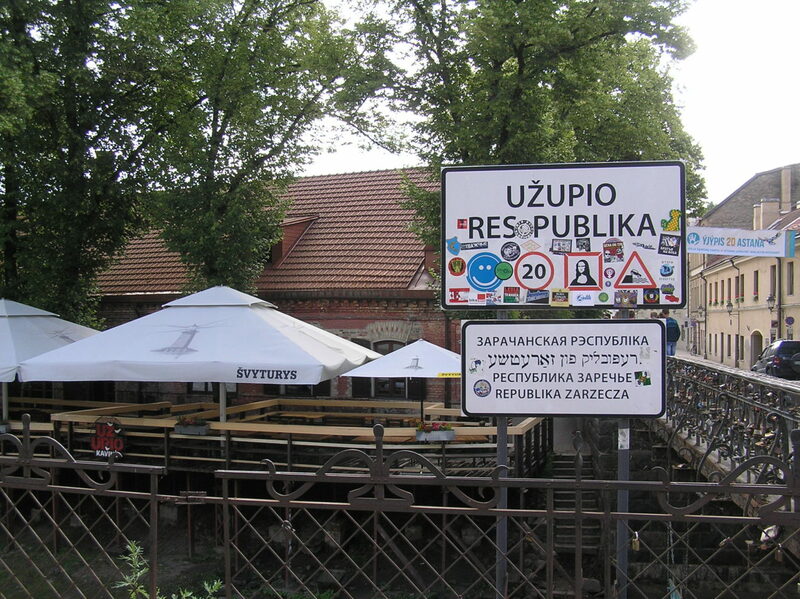 In 1997, the residents of the area declared the Republic of Užupis, complete with its own flag, unofficial currency, a president and a cabinet of ministers, a constitution, an anthem, and even an army of approximately 11 men. Citizens of Užupis even celebrate a separate Independence Day on the 1st of April. If you are a collector of stamps in your passport don’t miss a chance to visit the area – you’ll get an original one from Užupis! Užupis Angel – the 9-meter sculpture became a symbol of the district in 2002. Next to it, as an accent of the old city, one of the two old-fashioned cast iron water columns was restored. Užupis constitution – posted on walls of one of the main streets, it’s even translated into 18 different languages for visitors. Therefore, anyone who passes the street can get acquainted with the “laws” of this part of Vilnius. Don’t be fooled – you haven‘t seen a constitution like this before! For instance, “dog has a right to be a dog”, or “A person has a right to not be afraid” are just a few of them, but let’s leave the rest for a surprise. Tibet square – a small square which was renovated in 2008 marks the visit of Dalai Lama XIV who was given the status of a honorary citizen of Užupis. Adorned with prayer flags, it’s also a nice place to take a break from walking and read a book at the colorful Little Free Library. Bernardine Cemetery – one of the oldest cemeteries in Vilnius is truly a stunning place to visit. Founded by Bernardine monks in 1810, the Bernardine Cemetery has been recently restored. Whether it is covered in yellow leaves in the fall, or shrouded by moss in summertime – it still looks both stunning and mysterious. Open kitchen – it’s an open-air market of street food which takes place during the summer season on Fridays and Saturdays. Wide variety of food, cold drinks, good music and atmosphere make it a perfect place for a lunch or dinner outdoors! Kava tau is a cafe at the Subačiaus viewpoint where you’ll not only find good quality food but also a spectacular view of Užupis and the old town. Great combo! Šnipiškės is located north west of the Old Town and has a special atmosphere, where 19th-century wooden houses mingle with modern concrete and glass multi-storey buildings. For this reason, the neighborhood is referred to as “Shanghai” by the locals. 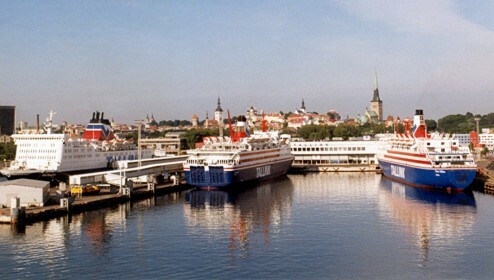 The multicultural community, which has lived here for a long time, has created a unique micro-climate, and the harmony of the old and new surprises many international guests of the city. Located on the other side of the Neris River, it’s a 10-minute walk to reach this eclectic mix of architecture. Europa Tower – this 149-meter building was opened in 2004 as part of Lithuania’s celebrations upon entering the European Union and since then it holds the title for the highest skyscraper in Baltic countries. You’ll spot it from various places in Vilnius as it’s higher than anything else. The shopping mall “Europa” next to it is where the local middle-class shops. Sakura Park – on the northern river bank, close to the “White Bridge”, is a park with sakura trees that attracts many people in spring when the trees start to bloom. 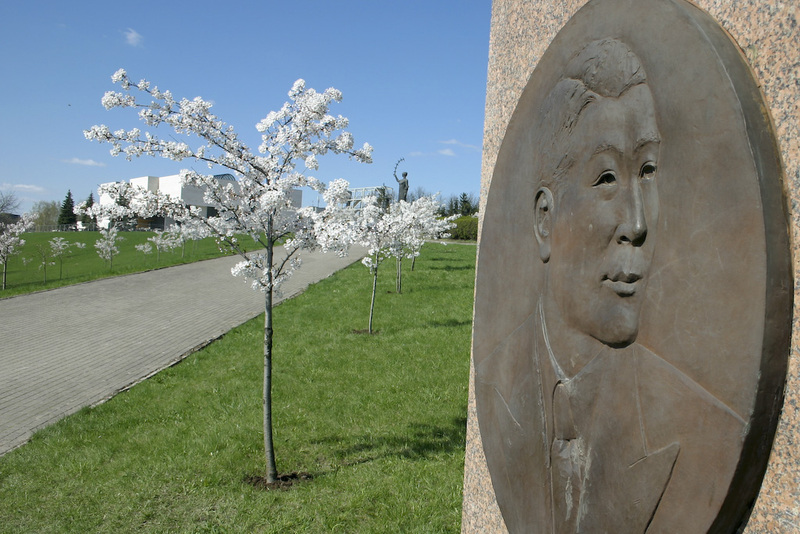 The park was dedicated to Chiune Sugihara, a Japanese Schindler who, while working as an ambassador of Japan in Kaunas, saved over 6000 Jews from Holocaust. When the spring comes, a selfie in this place is a must! Swedbank Terrace – another free place to enjoy the scenic views of Vilnius. East of the Sakura Park, it doesn’t require much effort to get there and is an awesome place to relax. The terrace belongs to one of the biggest banks in Lithuania – “Swedbank” and is open 24/7. National Gallery of Art – a must for art lovers! Built in 1980s, it used to house the Soviet Museum of Revolution. In 1993 it became the Lithuanian Gallery of Art where you’ll find the largest archive of Lithuanian art from the 20th and 21st century and a library/reading room as well as plenty of permanent exhibitions. You can find plenty of places in the Europa Shopping Mall or along the Konstitucijos Street, but something brand new and unique over there is Pirmas blynas – a cozy place for any kind of pancakes and crepes. The restaurant is social restaurant where most of the employees have disabilities. The restaurant frequently arranges various events such as language courses, board game nights and meetings with famous people. Vilnius is a green city with two regional parks. One of them is the Pavilniai Regional Park on the outskirts of the city, which attracts many people at any time of the year to admire the breathtaking views of nature. The park is located 6 km from the city center, so you can either take a public bus from “Žaliasis tiltas” (lit. the Green bridge) or “Vinco Kudirkos aikštė” – there is plenty of options, however, I’d recommend to check them a bit earlier before the departure, since the routs of the bus tend to change. Or you can call a cab with applications like “Uber” or “Taxify” which are considered as one of the cheapests in the city. It is worth a visit not only because of the unique landscape and natural features, but also because of its historical heritage. Pūčkoriai Outcrop – Undoubtedly, the most prominent feature of the park is the unique Pūčkoriai outcrop which was declared as a geological monument in 1974. 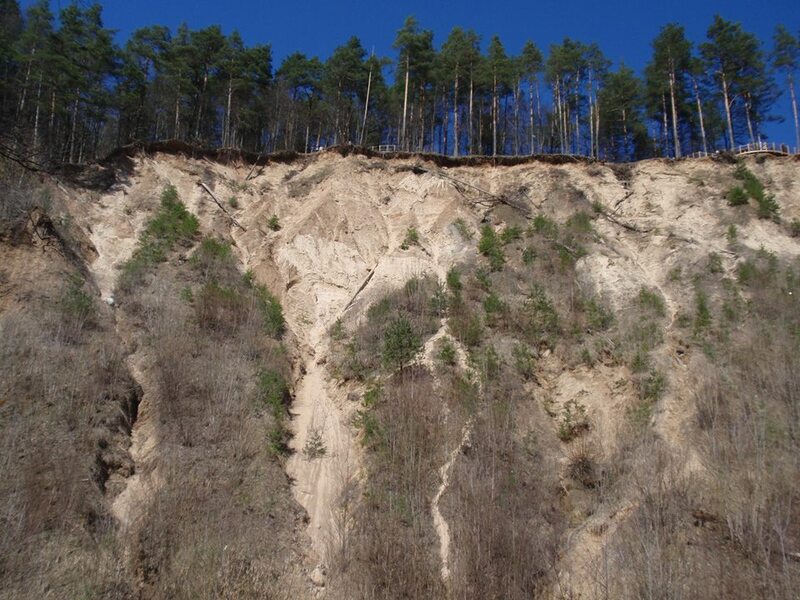 It is the highest and most impressive scarp not only in Vilnius, but also in Lithuania. The outcrop provides a spectacular view from above a high slope to the Vilnia Valley. This place is especially popular among Vilnius residents. Pūčkoriai Mound – dating back to the Stone Age, this is the oldest place in the regional park of Pavilniai. It’s one of the many Lithuanian mounds, which are hills that were used as fortified settlements until the end of medieval times. Moreover, Pūčkoriai Mound is an archaeological monument of national significance. Maybe not as impressive as Gediminas Hill, it still has a long and distinctive history, known since the first centuries of our era. Pūčkoriai (French) Mill – The remains of the French Mill stand on the right bank of Vilnia river. The banks of Vilnia are connected by a hanging suspension bridge. Recently the canal was leveled and the discounted dam, which was washed by the waters of Vilnia, got into the form of waterfalls and is often called as the Belmont Falls. Belmonto kriokliai – If you’re looking for a peaceful place, and at the same time feel curious about good quality Lithuanian cuisine – this is a great option! Located next to the French Mill, this restaurant offers many activities for children and adults alike. Žvėrynas is known for its wooden architecture and peaceful green areas. 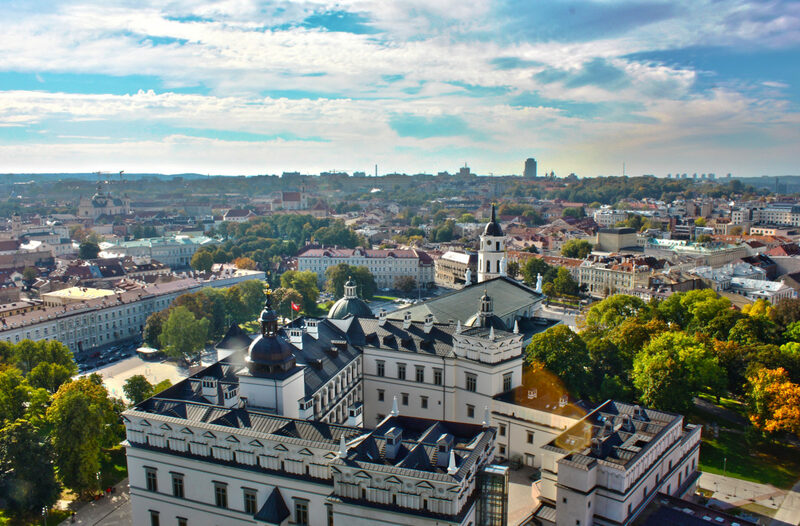 This district is often called the green neighborhood of Vilnius and is rich in pine forests. From the 16th to the 19th century, the area with its hunting reserve, was owned by a noble family called Radvilos. In 1938 it was assigned to become a residential district, therefore, the era of wooden architecture, which started at the very end of 19th century, ended and new modern buildings started to appear in the neighborhood. 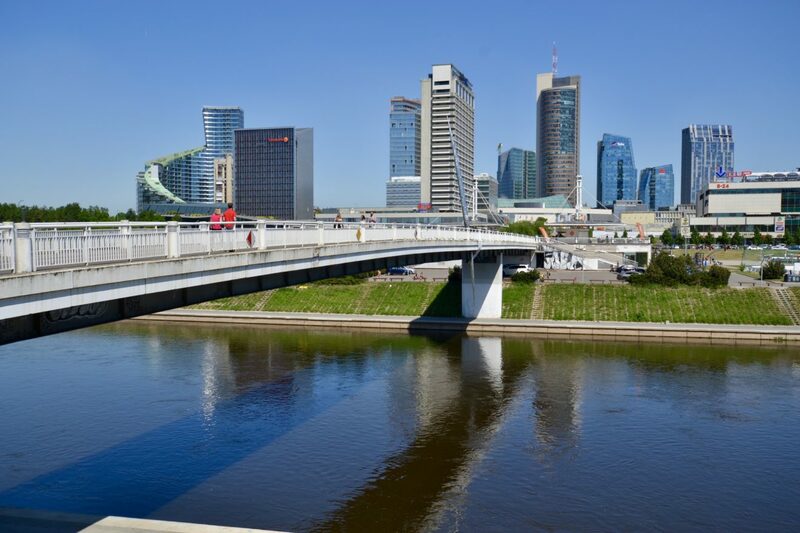 Nowadays the territory is considered as one of the most expensive and fancy neighborhoods to live in Vilnius because it is located very close to the city center. The streets of Žvėrynas – it’s as simple as that! Explore the district just by observing the old unique wooden fairy tale-looking houses in any random street of Žvėrynas. 108 of the wooden houses are included in the Register of Cultural Values for the unique mix of traditions of wooden architecture and the people from different nationalities that live here. Professional architects and also ordinary rural carpenters decorated the buildings with impressive wood carvings and patterns which are not repeated almost anywhere and. The Bridge of Žvėrynas – if you walk from Cathedral Square all through the Gediminas Avenue you’ll come to a bridge that crosses the Neris River. It was built in 1907 and has stayed more or less the same till now. In 1991 January 13, when the Soviets attacked the Vilnius TV tower and our Parliament, the bridge of Žvėrynas was the one that Soviets brought their tanks through and killed 14 unarmed people that night. Virgin Mary’s Orthodox Church – The “Virgin Mary sign from heaven” or otherwise Znamenskaya church was built in 1903 as counterweight to the Cathedral at the other end of Gediminas’ avenue. Karaims House of Prayer – Karaims are a small Turkic ethnic minority, some parts of which moved to Lithuanian territories in the 14th century. They started building their church before World War I and finish after it. Nowadays, it is rarely open – only on religious holidays and on Sundays, because only a very small Karaim community is left in Vilnius. There is a quite interesting detail about the Karaims’ faith – the religion is quite strict, therefore, their women can only marry true men of Karaim, that is the reason why many of them just remain spinsters, because finding a real Karaim is not so easy. WHERE TO EAT IN ŽVĖRYNAS? Žvėryno smuklė – the place for traditional Lithuanian food and good quality draft beer. Very cozy and authentic place which does not require much effort to find. And everything is very reasonably priced! Veranda – for those into a bit fancier dinner. Good quality of food and lovely atmosphere! Plenty of places to sit outside during the summertime and enjoy meals surrounded by nature and fresh air. Now only 10 minutes by bus from the city center, this used to be a separate village a few hundred years ago. Named after its owner Karolina, in the 19th century this area only had three households. 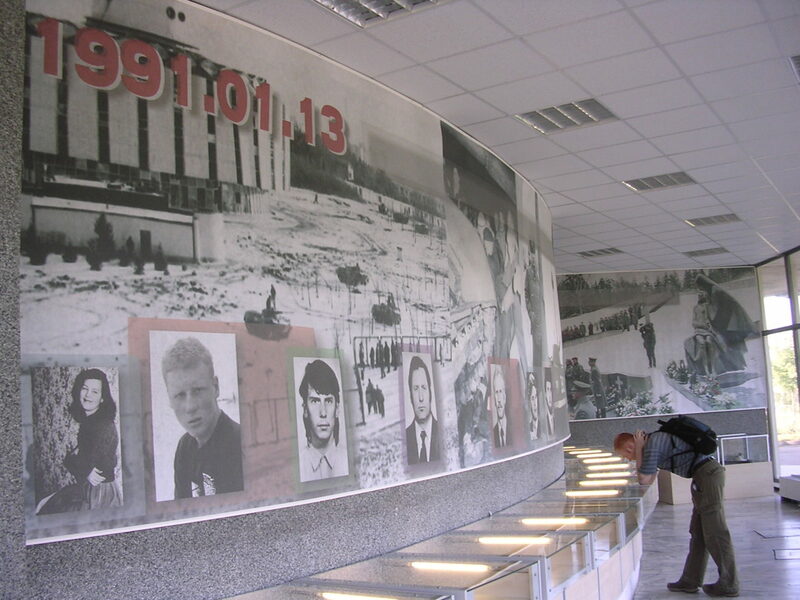 Karoliniškės holds a special meaning for Lithuanians since January 13, 1991 events. 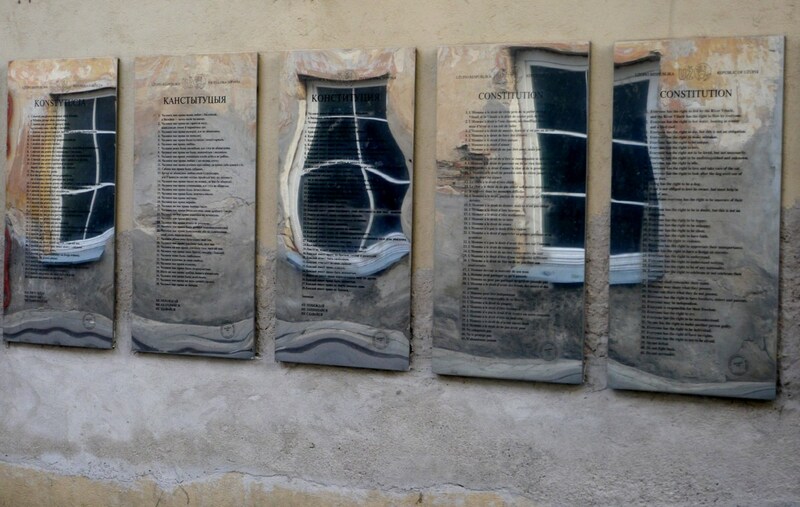 After 14 people lost their lives in order to protect Vilnius TV and Parliament tower from Soviets army, eight streets of Karoliniškės were renamed after the victims. Vilnius TV Tower – with its 326.4 meters, the highest building in Lithuania is included in the list of the highest buildings in the world. On January 13, 1991 it was surrounded by Soviet tanks who tried to take over the Lithuanian radio and television by force in order to broadcast Soviet anti-Lithuanian propaganda. Thousands of defenseless people tried to prevent this and fourteen were killed. There is a monument at the foot of the tower to commemorate those people while January 13 now marks the Day of Freedom Defenders and is a state holiday. Between 2000 and 2013 the tower was turned into a huge Christmas tree made of electric garlands. However, the 2014 decorations of interactive lasers did not look that good, so that may have been the reason they never decorated it for Christmas again. 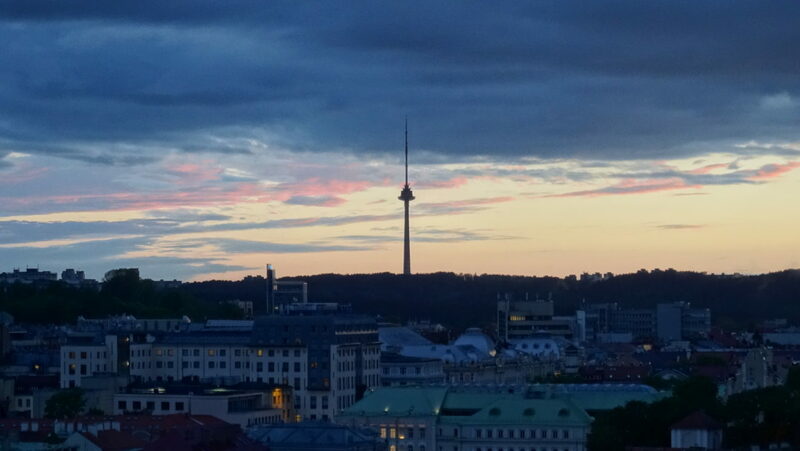 If you feel like getting some snacks for your visit to the TV Tower – don’t! 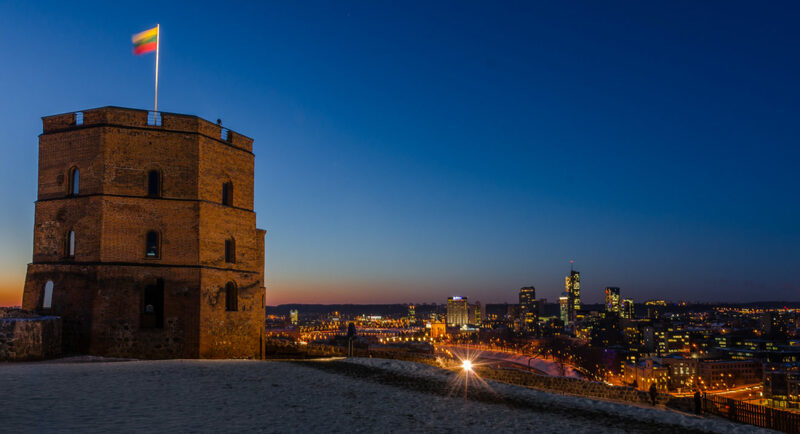 At the top you will find a restaurant with 360-degree panoramic views so you have a chance to enjoy the view of green and urban Vilnius as well as tasty food! Vilnius has many things to offer – starting from beautiful medieval architecture and ending with parks and relaxing nature. Therefore, we are pretty sure you will find activities that are the most suitable for you! 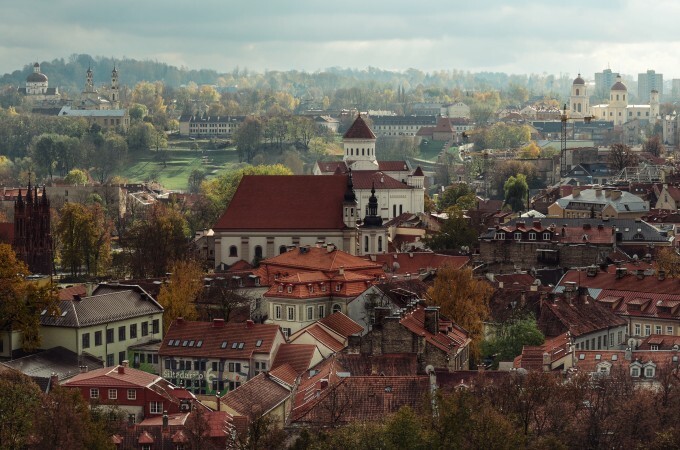 Let us know what you’ve liked the most in Vilnius? Any amazing location we missed? Now there is just one question – where will you go first? Well done! This has gotten me even more excited about our trip to Vilnius in April. Join us for a fun day exploring the historical castles and beautiful nature of Trakai National Park. Discover the South of Lithuania with beautiful nature & local history that is filled with surprises.